As the international film scene takes over Cannes for the 68th annual film festival, the local delicacies of the Luberon are front and center on many gastronomical plates along the riviera. Chief among them, the black diamonds of Provence, otherwise know les truffes. At the Cucina S. Pellegrino, a pop-up table d’hôtes in the heart of La Croisette, six iconic French chefs will showcase their talents for celebrities and media moguls from May 13 to 22. Jacques Chibois, from the popular Bastide Sainte Antoine in Grasse, features the native truffles in many of his dishes. 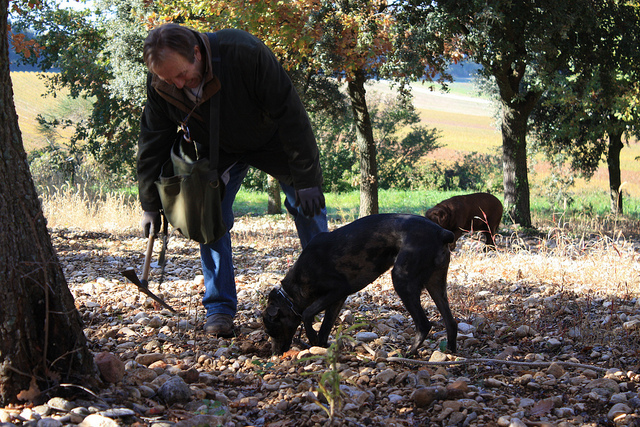 Three quarters of French truffles are harvested from around the foot of Mont Ventoux in the Luberon, most from cultivated forest land, and predominately with the help of trained dogs (said to be less greedy than the traditional pigs). Truffles are a passion in this region, and blessed by the catholic churches on the day of Saint Antoine, patron Saint of truffles. Our regional concierge in the Luberon can organize truffle farm visits for you during your stay in one of our luxury villas. These unique properties, often hidden and top secret for the protection of their precious black diamonds, allow visitors a glimpse into the careful art of truffle harvesting, and provide delicious tasting menus of this rare delicacy. Contact Isabelle@edenluxuryhomes.com to book your villa in the Luberon and organize an afternoon of truffle delights.